Contemporary perspective on the three pillars of vajrayana practice. Discussion on enchantment with dakini and protector practices and how that connects with the origin of these practices, protector meditation instruction and questions. This morning we are going to talk about protector. In the scheme of things actually, protector, dakini—it’s all in the same area. Now, some of you, maybe many of you, may have noticed there’s a kind of enchantment or intrigue around protector and dakini. It resonates with something in us. Any sense of what that is? How many know of what I’m talking about, that resonance? We’re not speaking Greek yet. That may come. But what is it? Ken: Yeah. That has something to do with it, mystery. Ken: Yeah. Can arise that way. Chuck? Chuck: I would say more or less something you can rely on. Deborah: Magical way of making things safe. Ken: Yes, we’ll go a little further into that shortly. Safe might not be quite the right word. [Laughter] Kate. Student: There’s something especially powerful. Ken: Yeah. So you get the feeling here. Anybody want to add something else? Karen? Karen: You play around with some really heavy images. So there’s something…they’re sort of dangerous, but there’s something light about it. Ken: What are these heavy images? You know, magic, threat, make things safe, something to rely on. What are these heavy images? I know you’ve only done this a couple of days, but when we do the protector chant in the evening, any experience come up for any of you? Ken: Okay, anybody else? Now everybody’s reading it very carefully! Janaki? Janaki: My relationship with that prayer changed each time we studied it. And initially it opened the floodgates of despair. And now it’s changed into a place of refuge. Chris: I’m going to get really remedial. What prayer are you talking about? [Laughter] Are you talking about the devotion piercing your heart or…? Ken: Fulfilling Intention. Page 25. Tom. Tom: Yeah, I mean it’s the demonic, whatever that is. Ken: Yes, but when you read it, what? When we chant it together, what do you experience? Now, I know what it is. What do you experience? Is there anything that happens? Is it just words? Tom: Well, there’s a pushing away. Guy: I have a sense of calm, because that power is always in play, but now you’re forming a relationship to it, you know so…. Ken: So you find it relaxing in a certain sense. Guy: A little bit. A little like being in a shelter, you know. Student: I find it exciting. Ken: Yeah. You’re right, I do. Ken: No, not for me. [Laughter] I’m quite clear about this. Deborah. Deborah: I feel like it’s taken all the scary stuff, and made it kind of accessible to me. Not so dangerous. Ken: Ah, safety. Anybody else? Student: I fell into a state of total confusion, after the session this morning. And the lines just started—it was like a chant. It wasn’t intentional. But it was quite soothing. Ken: You’re talking about the prayer that we did at the end? Ken: No, I am talking about page 25, here. Which is not exactly that paragraph. Student: Not…I mean after. When I was alone in my room. Ken: Oh, I see. Okay. You looked at the prayers, did you? Student: I didn’t look at it. It started repeating itself in my head. All right. Well. Heavy energies, powerful forces, very complex mixture of reactions and responses. I’m always reminded of Robert Bly’s commentary on the first part of Iron John. There’s a kingdom and there’s a forest in the kingdom. Anybody who goes into the forest never comes out. They’re never seen or heard of again. And this one person is coming on looking for an adventure. He hears about this, so he goes to the King and says, “I’m looking for an adventure. Can I go into the forest?” And the King said, “Okay.” Off he goes. He walking in the forest and everything’s peaceful, and he comes to this pond. He’s standing beside the pond and this hand comes out of the water, takes his dog, and pulls it under the water. So, in prehistoric times, life was highly contingent. As we know from anthropological studies, there’s a sense of a world peopled by incomprehensible forces. These forces were taken to govern illness, procreation, death, natural disasters, weather, floods, earthquakes, volcanoes. For one of the very deeply-seated human tendencies is an attempt to explain what we don’t understand. And then to rely on that explanation to know what to do, how to meet situations. The current and most powerful explanation of what we don’t understand—the mystery of our existence, our experience—is science. But ultimately, it is nothing more than an explanation. It just happens to be very powerful and very effective, allowing a high degree of predictability. But it doesn’t really answer such questions as why the sky is blue, or why one person gets sick and another person doesn’t. It’s still just the illusion of explanation. But when you go out where there are things that you cannot comprehend, you’re just going to have to act. There is no sense of control or management. You can’t manage the situation. Over time, as life became more and more civilized, more effective explanations developed. So the scope of these dark, incomprehensible forces became increasingly narrow. There’s a passage from the Four Quartets in which T.S. Eliot says, Sometimes I think the river is a God. He describes how it was in the original state, where it was this incomprehensible force which you could not cross. And which, when the seasons were such, could sweep everything away. Then gradually it was enclosed in embankments and bridges, and just became an object of scenery and a means of commerce, where God was tame. Until there’s a little too much rain. Then, as we experienced a few years ago, about ’96, ’97, there was a little too much rain in the Mississippi Valley. The river returned to what it always was. And you find the same thing with fires here, and hurricanes in Florida, and so forth. Protector practice came out of the propitiation of these forces. You established this relationship and you invoked darker, deeper, more powerful forces in order to deal with the ones that were a threat. But what is key here, when you invoke those forces, do you have any say in what they actually do? No. You have a situation. You have to deal with it. This is all that’s available to you. So it just goes. And what happens, happens. One significant area of life in the modern world where this is still true is war. In war, you set in motion very, very powerful forces. And they almost always produce unexpected results, because it just goes and does. And one of the fallacies that politicians from ancient time have fallen into is that they can actually control the forces that are set in motion in war. If you read Sun Tzu, The Art of War, he’s very, very clear about this. He says, The military is an ill-omened tool. Precisely because of this reason. It is absolutely the tool of last resort. If you’re a wise ruler, you would use any other means to get what you want because you have no idea what’s going to happen. A movie that I recommend that’s somewhat brutal, but very clear about this point, is The Battle of Algiers. It was made in the sixties, after the defeat of France in Algeria. It’s shot as if it’s a documentary. It’s not, it’s fictional. But it has a lot of depth to it, and one theme is the unpredictable nature of the forces that are set in motion. So, the protector comes out of this, as does the dakini. The origin of dakini is very similar to the origin of protectors. These were, again, anthropomorphizations, explanations, if you will, of forces in human experience which were incomprehensible. So, for instance, in the Chakrasamvara mandala, you have the four dakinis and their ancient names. One’s ancient name was killer, murderer—srog gcod in Tibetan. The yellow one, I think—not a hundred percent sure of, because it’s a long time since I’ve done the practice—was deformed one. Deformation. Another one was, shape shifter, and the fourth one, seducer—siren if you wish. Because, what happened? People killed each other. People murdered each other. What was the force that made that possible? Even today that’s regarded as something of a mystery. What produces the deformations, in character, or in physical appearance? Another mystery. People’s personalities are mutable and change and shift in all kinds of ways. Characters suddenly change. They become different people. What produces that? What’s the reason for it? Some people have an extraordinary power to charm, seduce, magnetize, coerce other people. Mistress. And people who are attributed magical powers, witches, and I think that’s actually probably the right translation for dakini. Same dark forces, you see. Tom? Tom: What’s the difference…what is the daka? Tom: And why are they so much less known and used than the dakini? Ken: In Indian mythology, or practice, I’m not sure they were that much less, because they’re continued to be referred to as dakas and dakinis. And in the Vajrayana power assemblies, they were set up that way. You had to have representatives of both for it to be a real power assembly. Remember, these were very esoteric cults, way beyond the pale of civilization. So, there might well have been more equality of men and women in those assemblies, which the society wouldn’t have tolerated for a moment. I don’t know a lot about that, but that’s my suspicion. Tom: Were the Tibetans also so monastic? Ken: Monastic, yes. But I’m sure there were a whole bunch of energy transformation practices and things like that which weren’t deeply practiced in Tibet, because those practices were so male dominated. And that’s one of the reasons why Machik Labdron stands out as a key figure. Yeshe Tsogyal and Machik Labdron are the primary female teachers in the Tibetan tradition. Yes? Student: Wasn’t there an overall balance, though, in the energy of a particular moment? In other words, we are talking about it in isolation here. But in a given whole representation, the energy would be equally represented in some capacity. Ken: In a given deity’s mandala? Ken: Oh, yes, yes definitely. Ken: We’re talking about cultural manifestation, not the practice manifestation. They’re a bit different. Guy: It just occurred to me that the protectors are consorts of the dakini, somehow? Ken: Not really, no. Because you have male and female protectors. We’re getting into that shortly. The other reason, I think, is that the female is the representation of wisdom and pristine awareness. That’s been the focus of practice, so giving expression to that is important. But I don’t really have deep answers to those questions. This is how it’s come down to us. I think that there are many, many different factors at work. In protector practice, as I said, you’re invoking, setting in motion, those very, very powerful energies, to deal with, originally, the contingencies in the world. Part of the genius of Vajrayana was taking these very, you might say, primitive methods and transforming them to serve spiritual practice. Okay, here’s where it gets a bit rocky. How many of you have any of those dark, inexplicable, incomprehensible forces at work in you? [Laughter] And what would it feel like to invoke the powers within you that would just take care of them? Student: Like becoming a reptile. Ken: Not exactly. [Laughter] Chris? Chris: I don’t know if this has any relationship, but I used to treat people with multiple personality. And what happens is they would have a certain identity to perform a certain function. And then this identity then kind of took over. So there was no real sense of power or clarity. I think it’s probably similar here. Ken: Right. Yes, except the forces that one’s invoking are expressions of awakened mind. So you’re letting your awareness do whatever needs to be done with all of that stuff in you. Guy: It’s not reptilian or automatic. I mean, that’s more a description of reactive. Ken: That’s true. Not really reptilian, but it does have this uncompromising quality. In the same way, and this is very important, Sun Tzu talks about this. It’s a maxim in military things: When the king sends the general to take care of business, the king does not tell the general how to do it. Things get screwed up—as we know very, very well, in American history—when the king tries to tell the general how to do it. “You have a problem, your majesty? I will take care of it”. That’s it. That’s where there’s no control, no management, it doesn’t make it nice. Ken: How do the protectors take care of this stuff? This is where the four kinds of activity arise. Ken: Four. [Laughing] Not one…. Ken: Four: Pacification, enrichment, magnetization, destruction. Some of those dark incomprehensible forces, or quirks, or destructive aspects in our make-up—and many of you know this from your own experience—all they want is to be heard. And then they’re quite happy and they go away, and say, “thank you.” That’s it. But as long as they’re not heard, they will reap destruction, in every aspect of your life. Anybody have this experience? Student: Which one is that? Ken: This is magnetization. That is: power, in the sense of energy, is used to establish that, “This is the situation.” And the recognition that, “Okay, this was actually unrealistic.” And then you come to terms with it another way. And then finally there’s destruction. This is very important. Destruction doesn’t necessarily mean destroying that particular energy. This is where it gets very unpredictable. It may mean destroying that situation in your life in which that energy arises. Or it may mean destroying the part of you that’s susceptible to that energy. Or is afraid of that energy. It can go anywhere. Because all of this is about restoring balance. 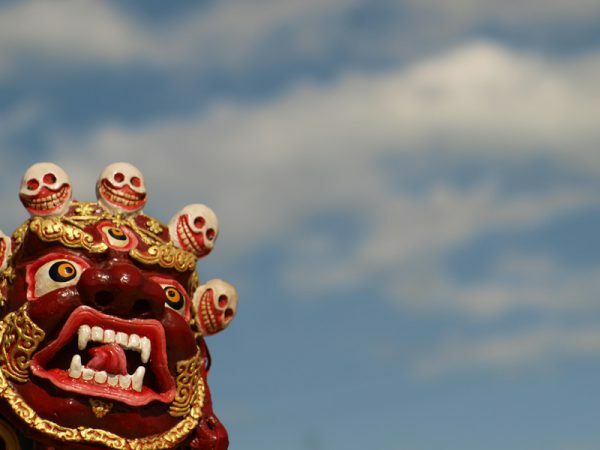 When we read the protector chants, yes, on the one hand it’s like, “Oooh.” But on the other hand it’s like, “Oh!” As Guy said, “something relaxes.” Essentially what you are doing is going into your nightmare and feeding the stuff of your nightmares to your nightmares. So your nightmares do what is necessary. That’s basically what’s going on in protector practice. Ordinarily we don’t relate to this stuff at all. Part of the genius of Vajrayana is that it relates to every aspect of mind. Even the creepy crawly stuff that is usually hidden under the rocks. So, in terms of your practice—and I’m a little apprehensive about this, I don’t mind saying, given the number of monsters that were born yesterday—you start off by developing a profound feeling of faith, devotion, in the guru. Ken: Profound feeling of faith, devotion in the guru. And you think of mind and guru’s becoming one. And in that, you assume the identity of your yidam. Student: That’s what we did yesterday. Ken: Adding a little wrinkle here. Student: Right. But we use that same yidam? Ken: Oh, yes. The same yidam as you were using yesterday. And then you feel all of those intransigent, intractable areas of your psyche. And if you don’t have any, we’ll have a talk. Ken: Pacification, enrichment, magnetization and destruction. Helena: Why did I forget destruction? Ken: [Laughter] I’m not going there, Helena. Then, you feel them, and you feel what is going to be necessary to deal with them. And then you feed those forces that can act on this stuff, whatever they need. And you let them go. Guy: You let them go. Ken: You let them go and do what needs to be done. You feed them. That’s the contract: you fed them, now they have their job and they go and do it. Student: Are you feeding them by recognizing them, or will you actually be feeding them? Ken: You are feeding them whatever they need. They’re hungry. They need energy! Whatever form that takes them. Be creative. Student: Is it the force of the psyche or is it the force that comes out of what arises in the psyche? Ken: You know what needs to be done. You know the forces that need to act on those things. That’s what you’re feeding. That’s the expression of your direct awareness. You’re feeding that. And then you’re letting that go and taking care of the intractable and intransigent parts of you. Ken: No you don’t bother trying to identify. Guy: You don’t at all. Ken: No, none. It’s all in the dark. Student: They can feed on anything. Is that’s what you’re saying? Student: Do you feed them, like, anger? Or is it just like I’m eating…? Ken: Whatever they need, you feed. Student: The forces that you’re feeding actually are the protectors that are feeding? Guy: Are there protectors and dakinis? Or just protectors? Ken: Protectors and dakinis, if you wish. It doesn’t make any difference. The dakinis are not Tinkerbell. You know, lion heads. They’re not to be trusted. Yeah. Anita? Anita: Okay. I’m confused. You assume the identity of your yidam? Ken: Of your yidam. Yes. Anita: Then, all those intractable forces. Ken: They’re there. They’re still there, aren’t they? Ken: You know what has to happen. And you know who can do it. Anita: Who knows what has to happen? Ken: You know. This is the stuff you don’t want to talk about. Student: Well, what’s the role of the yidam here? Ken: Partially to invoke. It’s to help put you in touch with your knowing. Student: With your knowing. Okay. Ken: Because that’s what the yidam is. You know that from your work yesterday. It’s a different kind, different level of knowing from ordinary consciousness. It’s an expression of your awakened mind. Student: See the hidden things. Ken: And seeing the awakened potential in what we often take to be a problem. Right? The yidam uncovers that. Vajra-anger. Ken: I thought as much. Student: Chö is basically working with the pacification and enrichment and this then would be working with magnetization and destruction? Ken: No, we’re working with all four here. Student: But chö only goes to the first two. Is that right? Ken: Not exactly. There are other aspects of chö. Chö works with all four. Student: Oh, I have so much more to learn. Ken: Not so much more to learn in terms of stuff. Just a little further to go into chö. You know, these karmic debt collectors. What do you need to feed them? Destruction. Student: So the intransigent, intractable areas of your psyche are the things that block your open awareness? Ken: Yes. Remember, what do the protectors do? They create conditions for you to practice, and they get rid of the obstacles and interruptions to your practice. This all sounds very nice when you’re doing it. What most people don’t realize is that most of those obstacles and interruptions are within. That’s where the protectors go to work. Student: Could you say that again? Say it again. Ken: The obstacles, interruptions and impediments to your practice. Where are they? Student: Right. But the first part—the protectors. Ken: The function of the protectors is to create conditions conducive to the practice of dharma and to remove conditions non-conducive to the practice. Those conditions are mainly inside. Those are the intransigent, intractable forces. So, you’re just unleashing hell on them. Ken: Well, if it’s necessary. Ken: But it is not clear what’s going to be killed, is it? Student: Well, some of those forces. Dan: You know there is many possible candidates of minor roles. Dan: Should we pick one, or two? Ken: No. The whole shebang. Ken: Absolutely. You don’t get to control. When you send the general out, he deals with whatever enemies there are. And whatever happens, he takes care of. You don’t get to control any of this. This is essential to understand. Once you unleash this, you don’t control. You just let it run. And you’re in it. That’s the awareness aspect. You’ve got to be right in the experience, right there. Student: Once the job is done, how do you know? Student: How do you know that the general is going to stand? This is a perennial problem, I mean. Ken: Yes. And that may happen. You want to wake up? You have an idea of what it means to be awake, don’t you? What if that idea is not how it really is to be awake? What has to be destroyed? Student: You mean what if that idea itself is an obstacle? Ken: Exactly. Anybody run into that one? Student: What happened to the vampires? They seemed like they were starting to take care of things yesterday. Student: They didn’t go far enough, they just sort of…. Ken: The vampires are the ones that set all this in motion. That’s why you move into the yidams first. No sane person would ever do this. Student: You forgot to mention that. Chris: I have two questions. Depending how you answer the first one. Is this similar to like, who was it…Milarepa, who put his head in the serpent? Ken: Oh, in the demon’s mouth? Ken: No, that was the easy part. Ken: That’s just opening to experience, that’s all. That’s not a invoking protector. No…. Chris: Okay, All right. I was afraid of that. So the second question is: Okay, I’m in this hell. It’s a complete nightmare. And I’m awake in this nightmare, because, well, I’m awake. Ken: You’re awake in the nightmare, all right. Chris: And obviously there’s no real understanding about any solution, because the solution hasn’t happened. And so that’s what I call the forces, to say…. Ken: Well, just a second. You’re awake in a nightmare. What’s the problem? Ken: Yes. But you’re awake. So what’s the problem? Chris: Well, that’s the problem. Ken: No, you have a nightmare. You don’t get to choose what to experience when you’re awake. You’re awake, there’s no problem. Ken: When you’re not awake in a nightmare, then you have a problem. Elizabeth. Elizabeth: And in terms of these four kinds of activities, do you assume that…do we keep those four kinds of activities in mind or just…? Ken: You can keep them in mind but you don’t have any control over the process. You just let the stuff do what it needs to do. Okay, now, do not do this more than once every half hour. Ken: You go through this process, invoking the guru, opening, joining. Take the form of your yidam. Feel what is intractable, intransigent. Know what needs to be done. Feed the forces which will do it. Let them go to do it. And rest in that experience. Then you just rest. Student: In open awareness—like before? Ken: Yes. Or whatever is there. You don’t do anything. Ken: And you do that once. Then if you wish, you could return either to the guru or to the yidam, for the rest of the period. Okay. And then the next half hour, you do it once. Now, realistically it’ll take a few minutes to set it up. And you can take as long as you want in that set-up and also in feeding. There’s going to be feeding them, moving into that, actually feeling all of those forces. This is the very place that none of us wants to go. You know what I mean? Okay. Student: I have just faced the possibility that there’d be a certain amount of resistance to this. And that very often takes the form of giving nothing or closing down. Do you have any suggestions of how… It can appear that there’s nothing there. I know that there’s not nothing there but…. Ken: Can you feel that nothing? Find that numbness. That’s your intractable, intransigent force. Student: You’ve said in going through these steps, describing the steps, that when we get to the part of feeling all the intransigent, intractable parts, that from there we’re to feel what’s necessary to deal with them. Or to know what needs to be done? Student: You’re just having faith that we will know what’s necessary or is that the same as just calling the protectors and…? Ken: You know. You don’t want to admit it. You wouldn’t tell it to your best friend. In the deepest secrets, but you know. Student: And that’s what we’re asking the protectors to do for us as their job? Ken: You see, there’s no limit to the depth of awakened mind. Gail. Gail: It’s the same thing as saying you’re saying tell the General what needs to be done. Ken: You give him what he needs. Troops, arms, money. Student: But then when…so I’m doing this in full awareness. So I will know what the protectors will do. Student: But once they have done it. Ken: Guy? Will the king necessarily get the report? Student: Is that a coup? Student: It could be false information. Student: Depends on the quality of their relationship. Ken: The King may be the problem. Ken: It’s like a lot of things. Student: I guess I’ll just ask the question. Ken: That would be extremely dangerous, but you’re welcome to. Student: Am I feeling the intransigence and intractability, or am I trying to identify…I mean I feel like I could spend the rest of my life identifying all the…. Okay, so are you clear about the practice? Ken: Last two questions. Deborah, Gary? Deborah: Is giving the protectors permission the same thing as giving them what they need? Ken: You not only give them permission, you tell them, this is what you want them to do. This fulfilling intention, I’ve struggled with the translation of this, for years and years and years. The phrase in Tibetan is thugs dam bskang (pron. tu dam kang). It’s almost always translated as something like atonement. So you’re telling him to do this. That’s a contract. You feed them, they do what you say. You give them the stuff they need. They go and do it. Ken: It’s not permission. It’s an order. Student: Okay. Is ordering them the same thing as giving them what they need. Ken: Yeah, I mean, you can do it as two separate parts or all at once. You can say, “Now, go!” And you can just let it run. Guy: It’s more than that. You’re demanding that they do it. Ken: Yeah. Yeah. You’re invoking…The obligation, thugs dam bskang, means literally filling up the obligation. By you giving them all of this food and offerings and things like that, they are obligated to do their work. Terry. Terry: Just one last time, could you go through the steps? Open, use any of the three kinds of faith. Use the prayer, etc., to open to the presence. Guru. Let your mind and the guru’s mind join. There’s openness there. In that openness, become your yidam. As your yidam, feel all of the intractable forces that prevent you from being awake. Just feel their operation, you don’t have to identify with it. When you feel those, feel what forces need to be invoked in order to deal with them. Give those forces everything they need and more. Don’t stint. Nothing worse than an underpaid army. They have the guns and they’re hungry. And then tell them to do what they need to do. And then just let it happen. Is that clear? Student: You said don’t do it more than once in a half hour. So if there’s time left…. Ken: Just rest in open awareness while you return to the feeling of being your yidam. Student: What if they want more than half an hour? Student: This general problem. It occurred to me the reason that you, you know, that you become the yidam first, is to reduce the chance that it’s going to be a…. Ken: You’re more closely aligned with the awakened mind. Student: So that you become the problem? Student: And if imagery arises? Do you allow that? Ken: Just be in the experience. Don’t start thinking. Whatever arises, arises. But be in the experience. And as soon as your awareness collapses down onto something, you’re no longer in the experience. Okay. All right.